I also tried out this frozen ‘steam in the bag’ butternut squash. I bought this a couple months ago, after a laborious squash-chopping session. It’s just SO much working trying to peel and chop butternut squash yourself for a recipe – this was SOOOO much easier (and safer?) – easily saved 20 minutes’ of chopping and slicing. I microwaved the squash, then I tossed it with olive oil, dried rosemary (substituted for fresh), minced garlic, crushed red pepper flakes, and salt and pepper, and roasted at 425 F for about 10 minutes. 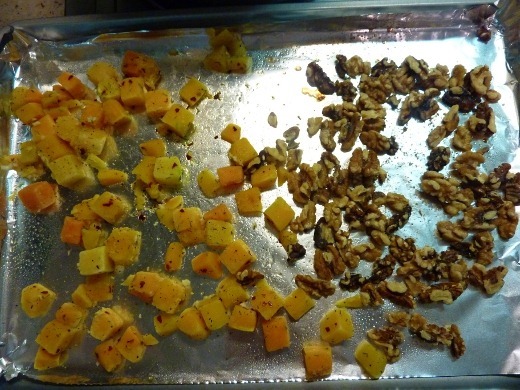 I also threw coarsely chopped walnuts on the roasting sheet, in order to toast them. I had to alter the recipe instructions a bit to accommodate the type of squash I used. While the butternut squash and walnuts were roasting and toasting, respectively, I cooked one cup of orzo in boiling water. 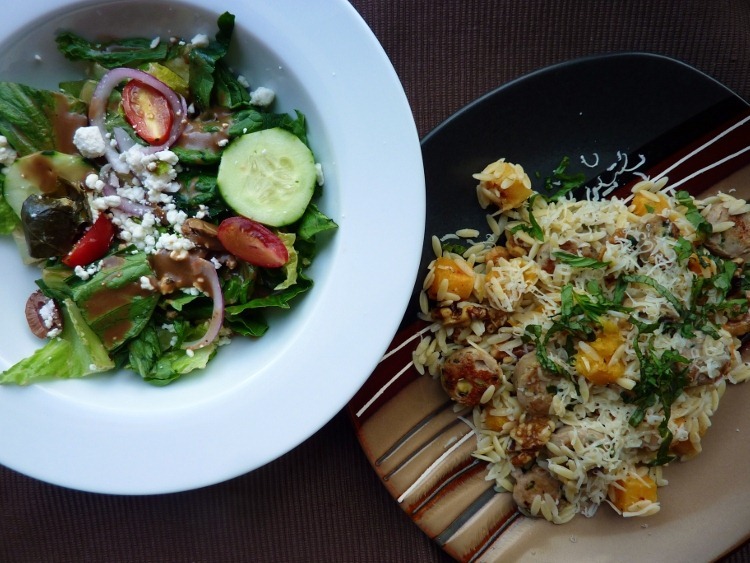 The orzo is actually the only ingredient in this recipe that I actually measured! 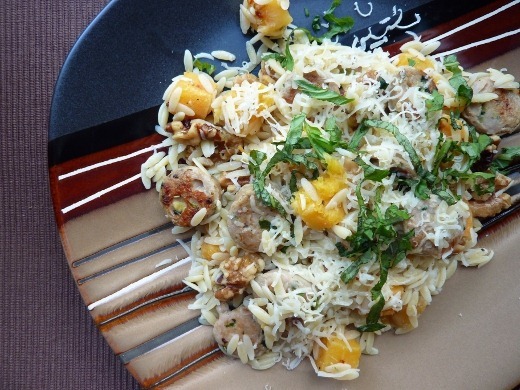 Once the pasta was cooked, I stirred in the squash and walnuts, and sprinkled with minced fresh basil and shredded parmesan cheese. I also stirred in 1/4-1/2 cup of the starchy pasta water to loosen things up a bit, and seasoned with salt and pepper. Mmm, the walnuts were so good! I poured a generous portion of walnuts onto my roasting pan – so glad I did. I really should eat more walnuts. So tasty! 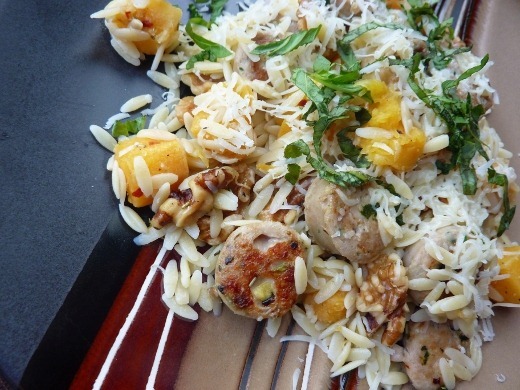 This plate was full of so many delicious flavors that worked well together – creamy butternut squash, nutty walnuts, salty parmesan cheese, bright fresh basil, spicy chicken sausage – yum! On the side I served a Greek salad from WF – which had kalamatas, the best grape tomatoes, feta, cukes, red onion, and even dolmas (stuffed grape leaves) in it! The chicken sausage was very tasty! I sliced it into 1/2” pieces and lightly browned it in an EVOO-coated skillet for a few minutes before stirring into the dish. 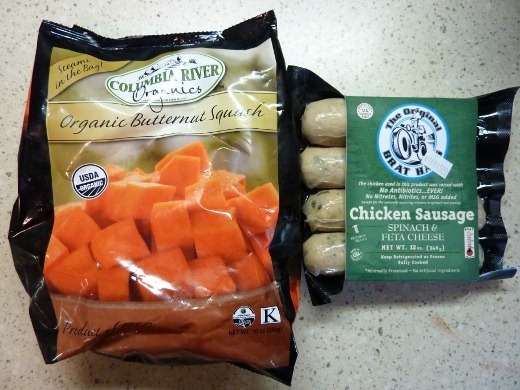 I would definitely cook with chicken sausage again! Next time I hope to actually try the Al Fresco brand. Tonight on their website I found a tool which allows one to search for stores carrying their sausage, BY FLAVOR. Booyah. My life of chicken sausage-scavenging just became even more exciting. I really hope to try the Buffalo flavor next, and am happy to see it’s sold at a local Kroger. Holla! 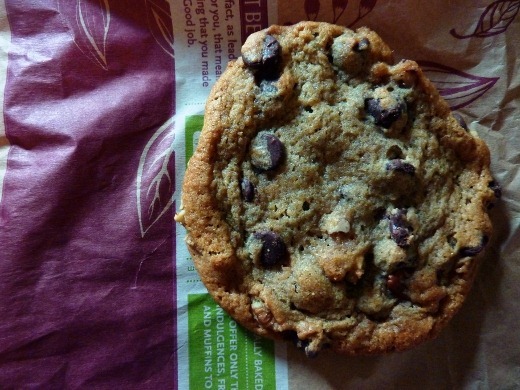 ‘Everything’ cookie for dessert, from Whole Foods. Mmm, chewiness. Currently listening to: Under the Bridge – Red Hot Chili Peppers. Eating Well is sponsoring a recipe contest. Its a one time vote only and if you vote you can even possibly win $1,000. The recipe that receives the most votes wins a trip to Vermont.